The Relentless Builder: Nigerian Student Wahala # 1: Who Pays For School? Wahala of the Nigerian Student is a blog series devoted to exploring the unique and sometimes commonplace problems faced by Nigerian students, with a view to finding solutions. To read the complete series, you can type "Student Wahala" in the search box or follow the conversation on Twitter, Google + or Facebook using the hashtag #StudentWahala. And now for Part 1 in our series. 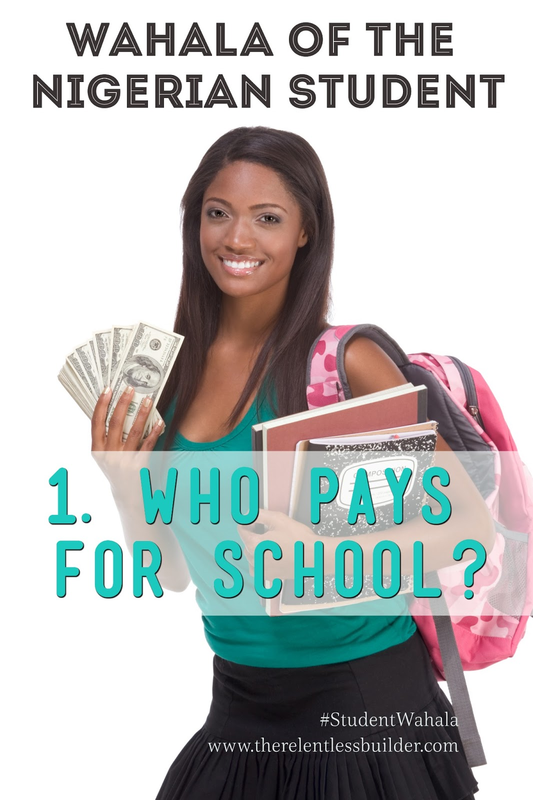 The first question that I wanted to address in this series was this: Who Pays for School? If you're like me, your answer would probably be "the parents of the child" of course! But that is not always the case. Consider this: The quality of education in Nigerian schools has deteriorated over the years. If you listen to people in your parents' generation, those who went to school in pre-colonial days and even after independence, up until say the '80s, 9 times out of 10, they'll tell you they attended public or government schools. That's because the standard of education in those schools was quite decent back then, such that sending your child to a public or government-type school did not mean that child'd education would suffer. In fact, some of the nations's best educators, well-trained teachers and non-teaching staff, worked at those schools. Now, if you grew up in the late 80s - 90s and even later, you'll understand that things had changed dramatically from our parents' generation. For the worse. And today, if you take your children's education seriously, and you can AFFORD it, more than likely, you'll want to send them to private schools. Why? Because in Nigeria's educational system today, you get what you pay for. Private schools tend to be better equipped (especially for sciences where laboratory equipment is absolutely critical to serious learning) and better organized than public schools, especially at the primary school level. For secondary schools, I would say it's 50-50. If you send your child to a federal government college, for example, the quality of education the child will receive (depending on location) is still better than sending your child to a public school (think "Jakande schools"). It is not mandatory to send your child to a private school at the secondary school level if he or she gains admission to a good federal government college, for example. However, I believe at the primary school level, it is non-negotiable, i.e. it must be a private school, if you don't want your child to speak YorubEnglish (Yoruba-laden English) to you. At the university level, private schools are an alternative where gaining admission to a Federal or State University or Polytechnic is taking too long, for example. Quality education usually equals more expensive education. Private schools in Nigeria, starting from nursery all the way to university education are very expensive and for those on a fixed income, can be completely un-affordable. 1. Atlantic Hall, Poka, Epe, Lagos. The fee covers the costs of return flight each year: boarding is N 2.5 million. 2. American International School, Victoria Island, Lagos. The JSS 1 – 3 pays $15,400 and SSS 1 – 3 pays $15,400 per annum. 3. Lekki British International High School Lekki, Lagos. The day students in JSS pay $10,500 and day students in SSS pay $12,000. Boarders in JSS pay $18,000 and boarders in SSS pay $19,000. 4. Green springs School, Anthony, and Lagos. The tuition fee for day students is N1.1 million while for boarding students it’s N1.9 million per annum. 5. Corona Secondary School, Agbara, Lagos. School fee is N760, 000 including development fee of N75, 000 which is paid once on entry. Mind you, some of these school fees are actually more expensive than college tuition for some public universities and colleges in the United States. NGOs and private individuals or like media people like to say, "Well-meaning Nigerians." Ideally, your parents should pay for your education. But if they don't, and you're lucky, then some of these afore-mentioned individuals can pick up the tab. And what if no one can pay? Then the student's education is disrupted indefinitely and the child/young adult becomes a hustler. In short, he or she drops out of school. Circumstances which can disrupt a child's education include: the death of one or both parents, loss of employment or demotion by one or both parents or caregivers, etc. Reform public and government-funded schools to bring them up to standard. Most people can afford to send their kids to public schools, but the quality is questionable. For those who cannot, see # 2. Financial aid should be made widely available for students to help them pay for school. It should not be limited to scholarships, but should include grants and student loans as well. I am not a fan of student loans, but I am sure some parents would be grateful to have that as an option. What are your suggestions for dealing with the problem of "Who pays for school?" Do you agree or disagree with the suggestions above? Kindly share. The fees where you used “$”… do these schools actually ask for dollars? Chei I (my parents) probably spent more in Nigerian secondary school than they did for my college education. VF (vivian fowler) then was 2mil per annum for boarding and tuition. And they now stipulated about 10k minimum per semester to be added to the students account for pocket money. In the Midst: Hmmm ... I am not sure, but I would not be surprised. As long as the school gets paid, I don't think they care. 10K for pocket money? Chai! See enjoyment. Poverty my foot! The lifestyle some Nigerians live in Nigeria trumps the one celebrities live here. "You went to Vivian Fowler? I would never have guessed" <--- lol, how would you have guessed before though? Jonathan: In Nigeria, private schools are the 'go-to' schools for those serious about quality education especially at the primary school level.